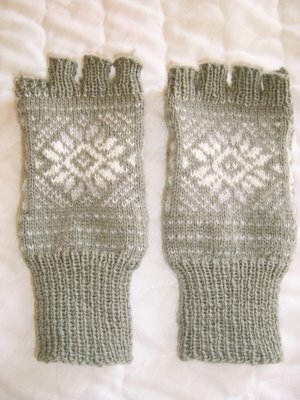 I finished my fingerless Snowflake gloves. Fair Isle may just be a new obsession. I actually had to frog the right glove twice. The first time, the snowflake design was going to be too low on the back of the hand, so I added a couple of bottom borders and the second time, I put the thumb opening a wee bit too high. Third time's a charm though because they turned out well. I am aware that the pinkie on the left glove is a little short, but there is a reason. I am a continental knitter which means I wrap my yarn around my left pinkie, so I had to leave that free as I'm very likely to be knitting with my gloves on. Why else would I make fingerless gloves? Here's a closeup of the snowflake design. 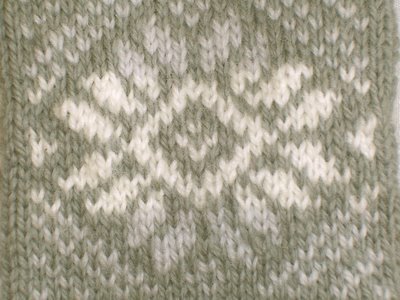 I enjoyed working with Knit Picks Palette yarns and I will be doing more Fair Isle. Beautiful! You do good work. Those are the most beautiful gloves I've ever seen!! So, so gorgeous. Love the colors and I can't even imagine all the work that went into making each individual fingerless-finger. :-) Do you have any books you'd recommend for getting started with Fair Isle? Again, beautiful work. Great job with your tipless gloves, they turned out beautifully. I love your short picky -- nothings going to hold you back from your knitting! Smart and beautiful! I'll need the same - love the idea to knit in the open with those beauties on. Félicitations! I love them so much! I have to go see about ordering some Palette myself. WOW! Those are gorgeous gloves! I've only knit socks and I've been keeping my eye out for gloves. Think I will just have to get that book! Beautiful gloves - love the sage green! those are gorgeous gloves! You did a beautiful job! Welcome to the knitter's world of color and its magic. Just finding time to look at all the fingerless gloves from Peaceful Palms. Yours are so lovely. Great job with the fairisle. How are they holding up?